Under the provision of the Asylum Act 1853, the Corporation of London was empowered by statute to provide an Asylum for the insane of the City. They first looked at whether Bridewell or Bethlem would take their pauper lunatics but this was not possible so, as the Act of Parliament clearly stated, the Corporation had to fund one of its own. Land was purchased at Stone near Dartford. The site was on a hilltop with panoramic views to the river Thames. The committee purchased 33 acres at the cost of £100 per acre. An architect, James Bunstone Bunning, was employed and plans for a male and female wing separated by a dining hall (with chapel above) were drawn up. The asylum was fitted with workshops for employment of the patients, a coach house with stable and staff accommodation. The first stone was laid on 19th July 1862 by the Chairman of the Committee Sir Thomas Dakin Esquire. A time capsule was placed under the foundations stone. The asylum for 250 patients opened on 16th April 1866. The cost was £68,105. A Committee of Visitors was formed and contained Aldermen and Justices of the Peace. This Committee oversaw the running of the asylum along with the Medical Superintendent, Dr Octavius Jepson. From 1866 to 1888 the asylum continued to expand. Extensions were added to accommodate more patients and staff. After the 1888 extension the asylum accommodated 549 patients. In 1888 Stone Lodge Farm was also purchased. This enabled the hospital to grow more food and provide a healthy outdoor working environment for some of the patients. The Asylums Act of 1890 allowed Private Patients to be admitted. With the recent acquisition of Stone Lodge Farm the Committee decided to offer accommodation to Private Patients in or near London saying ‘it has a healthy locality and convenient access for a moderate cost’. Private Patients were admitted from 1st January 1892 at a cost of £1 per week. In 1900 the asylum underwent an upgrade. 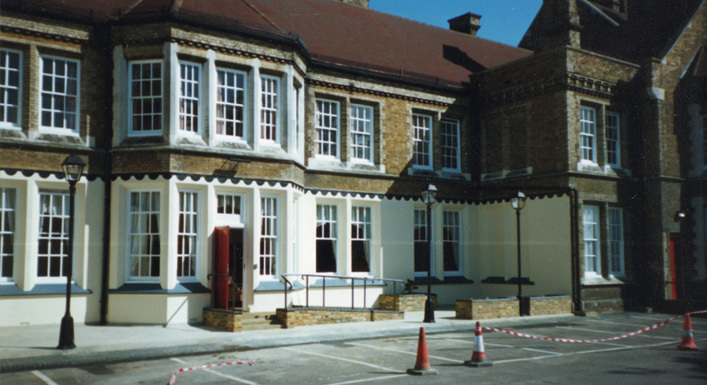 Electricity was installed, a large summerhouse build in the grounds, the clock tower and belfry over the administration block was erected, sanitary spurs were added to the wards, a new telephone system installed, the chapel build and the old chapel above the dining hall converted to a recreation hall.